The purpose of building up a mound and adding plants to that mound may be practical, aesthetic or both. Mounds are built in layers. The bottom may be compostable newspaper or cardboard to act as a weed barrier, followed by healthy soil mixed with compost, and the surface protected with organic mulch. This basic structure is adaptable to suit specific needs, such as adding a layer of hay for plants that need higher levels of nitrogen. A garden mound for vegetables may be 2 feet high and 3 feet across. Using several mounds throughout the garden area increases the square footage available for planting. Mound gardening may be considered a form of vertical gardening. Squash and cucumber may be planted in mounds, as well as root vegetables such as beets or potatoes. Creating garden mounds is a practical solution to the problem of poor soil quality. If your garden soil is difficult to work, building a mound made up of quality soil, compost and mulch relieves you of having to dig into hardened soil. The mounds, in turn, will feed downward, slowly building up the quality of the underlying soil. A garden mound allows for several plants to occupy a smaller space. The result is a more efficient use of resources. By leaving the top of the mound unplanted, and making use of the vertical space, you can water and fertilize from the top. Less water and fertilizer is required because the resources are targeted directly to the plant roots within the mound. Garden mounds may also be shaped and embellished to create herb and flower beds. One form of mound planting is soil encircled by a low rock wall, with another soil bed and rock wall, raised, in the center. 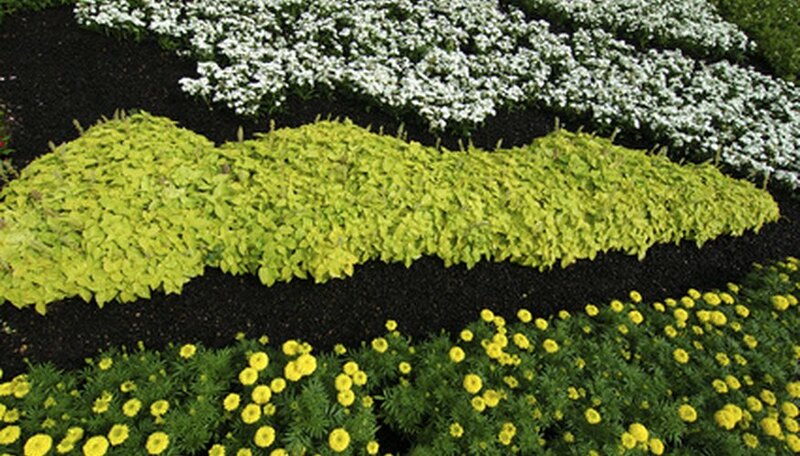 With ascending tiers, the mound may be made to resemble a fountain, each soil bed hosting flowers and herbs. This makes for a manageable garden and is a practical use of space. Mounds are used in landscaping to alleviate erosion or add visual interest. These mounds may be large, as long as 8 to 10 feet, and are sometimes referred to as berms. If you require a berm in your landscape, you may wish to plant flowers, herbs, and small trees in the mound. Otherwise, it's just a big pile of dirt. Berms may also be sculpted, creating slopes and tiers. The variety of heights within the mound then allows you to plant small trees and shrubs along with tall flowers, herbs and ground cover, creating a focal point for your landscape. Landscape Design Site: What is a Berm?